As the level of UK unemployment reaches a 10-year high, Paul Mason retraces George Orwell's journey from The Road To Wigan Pier, to find out how recession and unemployment are affecting people in the West Midlands today. I could be describing today's news but it is actually a scene from George Orwell's classic The Road to Wigan Pier, written in 1936. 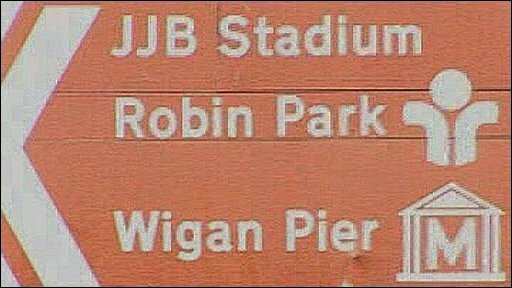 In the book Orwell does not write much about the actual route he took to get to Wigan. Back then the grim northern coalfields were the symbol of recession, not the Midlands. But, using his diaries, I am about to retrace that route, to find out how recession and unemployment are affecting people today. I set off by train to Coventry. Orwell then walked to the Bullring in Birmingham, but I am on deadline so it is the train for me. We're at rock bottom here. It can't get any worse. The Bullring itself, hi-tech and recently rebuilt, is full of shoppers, mainly young. But there seems to be an oversupply of fast food joints compared to demand. Outside I meet a group of college students. They are fed up because there are no casual jobs on offer here anymore. In one big store I ask the man at the till what the jobs market is like. It is my first taste of the way unemployment is hitting the highly flexible, post Thatcher jobs market. Though it is a time of big layoffs from famous workplaces, there is also this hidden impact: students can't supplement their incomes with casual jobs. On the steps of the Bullring centre I meet Will. He has just been made redundant as a laser cutter in a metal factory. With most of the West Midlands in some way connected to the auto-industry, it is not surprising to find people like this. There were 12 workers, the company he says went "half bankrupt" and sacked six people. What does slightly shock me, and will become the theme of this journey, is what he was earning. Aged 23 he was being paid the exact hourly minimum wage of £5.73 an hour. He was taking home £700 a month. Here is the second big fact about the modern labour market you won't readily appreciate until you experience it. There are a lot of people, and it seems far higher than official statistics can capture, earning at or just above the minimum wage. Will is already looking for a job. He does not look forward to going to the Jobcentre, which he sees as "a hassle". By nightfall I am on the Number 9 bus from Birmingham to Stourbridge, following Orwell's footsteps. The bus is full, of tourists, young people and commuters going home for the night. This, and the buzzing shopping precincts around New Street, are a reminder that if we are falling off a cliff economically, it is a high cliff. There has been incredibly high levels of economic activity and employment in the boom. And in places like Birmingham, with a youngish, ethnically diverse population, large public sector and large student body, the full scale of the crisis has not yet hit. Stourbridge by contrast is quiet. Jo, an admin worker at a local college tells me that when Woolworths closed, and Zavvi, it started to feel like a bit of a ghost town. Orwell walked from here to a youth hostel in Clent. I settle for the Dudley branch of Travelodge. Clean, stark, a lot like every other Travelodge, and not doing much business. The day starts with a bacon sarnie in the Fry A Tuck café, Brierley Hill. This is full of scaffolders, ordering breakfast and getting their midday meal packaged up for them (one guy is ordering "dry bread"). They have a mass snowball fight in the road. Construction is still booming here and across much of the country. Even if house building has stalled, the civil engineering and renovation businesses are set to be, if anything, boosted by public spending increases. I am following Orwell's route to Hanley, in Stoke on Trent. Much of Orwell's "Road To" diary is about chaffinches, badly designed housing, rubbish landlords etc. As if he is saving the outrage over the unemployed until he gets to the real black spot. Today you do not have to save your outrage. 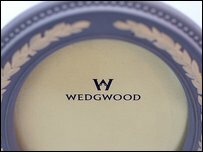 At Stoke railway station there is a statue of a giant of the industrial revolution, Josiah Wedgewood. I head for his factory at Barlaston. It has just gone into administration, with 367 workers sacked at one day's notice. It is eerily quiet. Still ticking over but not exactly a hive of production. Keith, my taxi driver, tells me he used to work in the pottery industry as an electrician. He got himself a BA and then an MA in ceramic design… just at the point where Royal Doulton moved its production to Indonesia. "We're at rock bottom here. It can't get any worse. Eight out of 10 people I pick up are single mums, long-term unemployed, pensioners, long-term sick. They're not going to lose money in the credit crunch, plus things are going to get cheaper. It's the south, where people have been earning £50k that's really going to suffer." He is resigned to the move of ceramic mass production overseas. What is the future for places like Stoke, I ask? He says it will take 20 years, until the workforce of China and the like get wages as high as in the west, and then there is a chance we will get some investment. This seems to me brutally realistic. What is clear from my visit to the potteries, is that no government seems to have done anything to anticipate this rapid, recession led, stripping of skill and industry out of the heart of Britain. What is the "industrial strategy" of this and previous governments? You tell me. In the meantime Stoke has become famous for something else other than bone china. With 9 BNP councillors it is the biggest single power base for the far right in Britain. Labour, says a long-standing party member from the town, has "collapsed as an organisation". I travel to Manchester, the imperatives of broadcasting demanding a live "two way" because the Bank of England has slashed rates again (it was last Thursday). That is my excuse for not staying in a Travelodge this time, but somewhere plusher, though within the BBC's expenses ceiling. 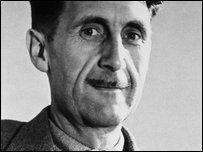 Orwell came to Manchester to see trade union activists who would take him to Wigan. He stayed there five days getting acclimatised, as if preparing himself for the squalor. The thing I take away above all, loud and clear, is the mood of resignation, but not despair, among the people I meet. We are at rock bottom, how much worse can it get? Today the North West is not the centre of this jobs massacre. It has had a lot of regeneration money and Manchester, like Birmingham, is still riding on that self-sustaining, part-casual economy that has emerged in the years since the 1980s. It is nothing special about the city itself, or cities. I remember these streets - Oxford Road, Whitworth Street - when they were as dreary as a Morrissey record. Finally time to go to Wigan. I get a minicab some of the way. Orwell described coal miners as "grimy caryatids" holding the rest of the world on their shoulders. Today you could argue minicab drivers do the same. No student would get home from a party; no pensioner to their chiropodist; no inebriated journalist would find their way home without these near invisible but vital public servants. Here are some things I have learned about the minicab trade on this trip, thanks to Keith in Hanley, Muneer in Dudley, Atwal in Manchester. Business is about 30% down; people are not going out anymore; lots of pubs are closing; some nights there are up to twice as many blokes in the cab rank as there used to be. So, instead of there being four in the queue there are nine, and there is an influx of former factory, shop and warehouse workers into the cab trade. Here is something else I have learned. Wage cutting has silently become a growing response to the recession. I met Diallo Njoh, a hairdressing boss from Ashton. To avoid laying people off he has persuaded the staff to take a pay cut. The general secretary of the pottery workers' union, Unity, tells me a similar story. Ceramics bosses in Stoke are offering pay cuts and short time as an alternative to layoffs. This makes my economics radar bleep. If we get this wholesale, it will lead to deflation. Finally, I arrive in Wigan. I am technically from here, though my home town is Leigh, whose inhabitants tend to view Wigan council itself as an occupying power. So I am always careful never to diss Wigan. The sun is shining. There have been some job losses here, but it is not the centre of the unemployment universe anymore. It has diversified, and there has been a lot of regeneration. There are yuppie flats one side of the canal leading to the famous non-existent pier, and on the other side, Wigan Investment Centre. Short of actually opening a branch of Goldman Sachs on the canal towpath, it is a clear signal of intent, the days of misery are over. I sling my rucksack onto the train and settle down with Wigan's famous delicacy, a meat and potato pie. What have I learned? That unemployment, tough as it is, is not the only story of the modern labour market in recession. The line between work and benefits is already blurred. At every Jobcentre terminal, when you pick out a low-paid job, it informs you you will be able to claim Tax Credits. Then there is the sheer amount of casual employment. There are 130,000 hairdressers, 250,000 minicab drivers. If they are all experiencing pay cuts, short time or income drops on the scale I have found, it is big news economically, but it is getting lost. At the Jobcentre Plus in Moss Side they told me there were 2,500 vacancies in Greater Manchester, probably another 4,000 they don't see. And that there is high turnover. People are coming out of one low-ish paid job and going, fairly sharpish, into another low paid job. Retail, call centres and admin are still taking on, even the Jobcentre is advertising for new staff! Huge numbers of the jobs on offer in the Jobcentre are what they call entry level, at or just above the minimum wage. Of course, once you hit that, you cannot cut pay below it, so if things get worse you will see more people on the minimum and more minimum wage jobs being lost as well. In economics they call this, emotively, a "race to the bottom". In this, I think, Keith speaks for a whole segment of the nation. It will sound strange to hear this if you only get your economics from the high-brow media, or live in London, because we are supposed to be at the end of a boom. Either the memory of that boom did not last long, or it was not very kind to large numbers of people. One glance through any pawnbrokers' window (there are loads of them in case you hadn't noticed) will tell you it is probably a bit of both. That's enough pontificating, enough pie, and enough Orwell.